Arjuna is a pretty pathetic show, it really should be sold in a box set because after you've seen the first one your not interested to see the second, and because the first DVD only just touches on the plot and does allot of character building you'll find by the end of the DVD you will be quite uninterested in what�s going to happen next. The main problem is that the young girl in it is very annoying and when she does finally get into some action she doesn�t really do much it�s really more of a reaction than a conscious decision. The main problem is that there�s not enough action, and by the end the only thing that�s been explained is that the young girl Arjuna has inherited a fantastic power that she�s too scared to use anyway. 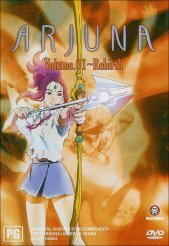 Arjuna is the name of the main character and at the beginning it�s really hard to know what�s going on but as time goes by you realize that she was in a terrible bike accident and a young boy saves her in exchange for the powers he hands down to her and her new quest to save things from a great evil. What I can�t understand or so much what�s not explained is what exactly she�s fighting against and what for, I mean I dint know if she�s saving the world, if she�s protecting the space time continuum or what she�s doing; basically all I can figure out is that she battles bad guys, and all in all there is only one battle for the whole story the rest is all character building. Another problem I found was that all the extras where in Japanese, the karaoke not much good unless you can read Japanese fluently, all the TV spots are in another language and another thing the artwork sketches are pretty dodgy too. The only decent extra is the trailers of good anime. The picture and sound quality was very high but unfortunately for the show the story was quite uninteresting I found myself wanting to get up and do something else, and I don�t say this often but unless you're going to go out and buy the entire series at the one time the first instalment is a real waste of time; it will leave you confused and having to think about what�s really happening, and quite frankly you just won�t get an answer. In the immortal words of Fry, TV viewers don�t want to feel stupid and huge changes make them scared people want to see the same things they�ve seen a million times over and over having such and in depth story with nothing but questions and giving the viewers no answers; by the end I guarantee that you WILL feel stupid and scared. The story could have given it some sort of ending other that �Wow another close call for the good side, but I�m still not going to tell you what we�re fighting for�, this type of mentality and story writing has caused me to not EVER bothering to attempt to see the rest of the Arjuna series. I�m only going to give this DVD anything above zero because the animation was exceptional and the sound quality was quite impressive, but ideally the story line still killed it, kudos to the animation team but �Boo� to you writers. Keep up the good drawing.